Making a technical presentation to peers is different from making one to C-level executives or to customers. 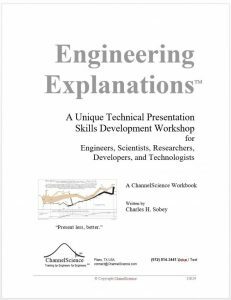 To achieve targeted improvement of technical communication skills, ChannelScience also offers our Engineering Explanations™ 2-day workshop. It provides presentation skills development for top technical experts as well as new hires. STEM (science, technology, engineering, math) participants use their natural problem-solving abilities to improve the clarity and impact of their technical presentations. Videos, examples, exercises, and respectful classroom feedback are used extensively. Customization of this class for the specific needs of your team is available.